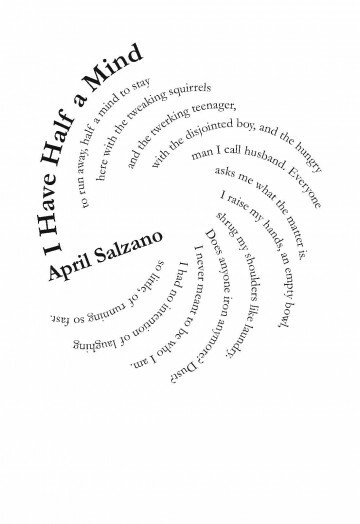 April Salzano is currently working on a memoir on raising a child with autism and several collections of poetry. Her work has been twice nominated for a Pushcart Prize and has appeared in journals such as The Camel Saloon, Centrifugal Eye, Deadsnakes, Visceral Uterus, Salome, Poetry Quarterly, Writing Tomorrow, and Rattle. Her first chapbook, The Girl of My Dreams, is forthcoming in spring 2015 from Dancing Girl Press. The author serves as co-editor at Kind of a Hurricane Press. There is so much distance packed into this short poem. The speaker is a wife and (presumably) mother but she describes her children as if they were strange wildlife. She uses the word “husband” but insists it’s just a name. And who among us hasn’t had that disorienting “how did I get HERE? !” moment or wondered if it might be best to scrap everything and start over? The poet moves deftly through the rhythm of these moments: how our estrangement from ourselves first shows in our estrangement from those we love; how we feel out of sync with the rhythms of life (“Does anyone iron anymore?”) when in fact we’ve lost sight of what makes life worth living (I had no intention of laughing/ so little”). Closure in moments of unhappiness and indecision seems like it will never come. In this poem, it never does. The speaker has only just begun to organize her thoughts, so the design is arranged loosely to convey a similar series of shrugs and turns, first this way, then that, spiraling on itself. While this circular pattern suggests a hurricane, an actual storm possesses a clearly defined eye at its center. The speaker here has no such clarity, so the form needed to remain a little scattered. The typeface for such an unusual shape had to be extremely regular and legible—the last line is almost upside down—and Garamond fit the bill perfectly.